Thanks for making 2012 Day of Action a success! During the 17th Annual Day of Action on Wednesday, April 25, volunteers from the community assisted with 17 projects at 9 local nonprofits. 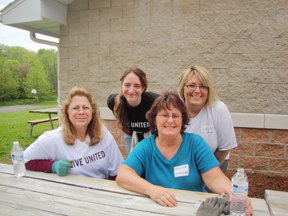 Community members volunteered their time at United Way of Monroe County partner agencies and other local community organizations participating in activities such as building bookshelves, painting, spring cleaning, event promotion, and gardening. See more images from the event on our Facebook page and in our ad in the Herald-Times! Thanks to Dann Denny for his excellent on-site reporting in the H-T and to WFHB for their story about this exciting day:. For more information about how you can get involved with the next Day of Action, please contact United Way at (812) 334-8370.